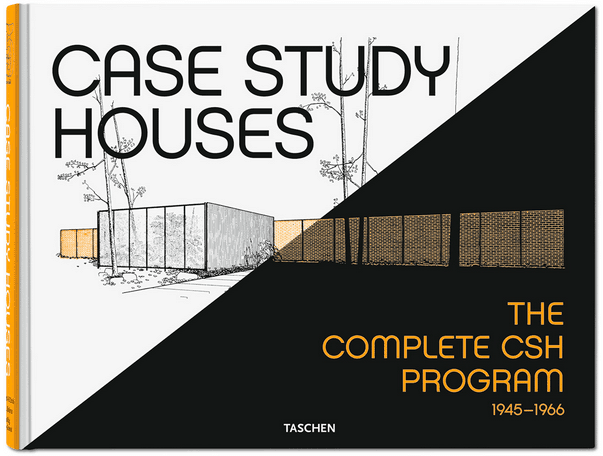 No one would have thought the sheer luck Rob and Mary Lubera were about to encounter when they began to dig deeper into the ancestry of their new home. 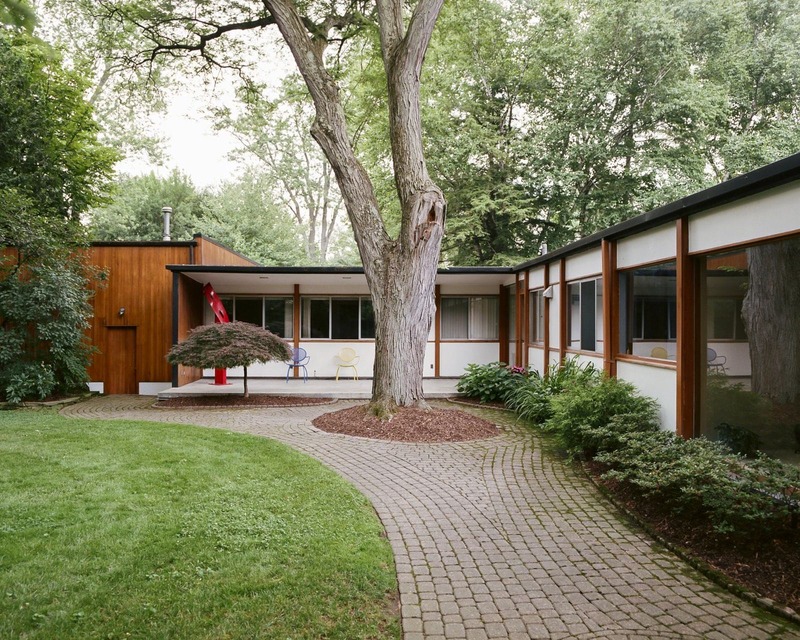 Astonishingly enough, the couple was in possession of the last surviving Alexander Girard residence, discovered among rows of Tudor Revivals in the suburbs of Michigan’s Detroit. 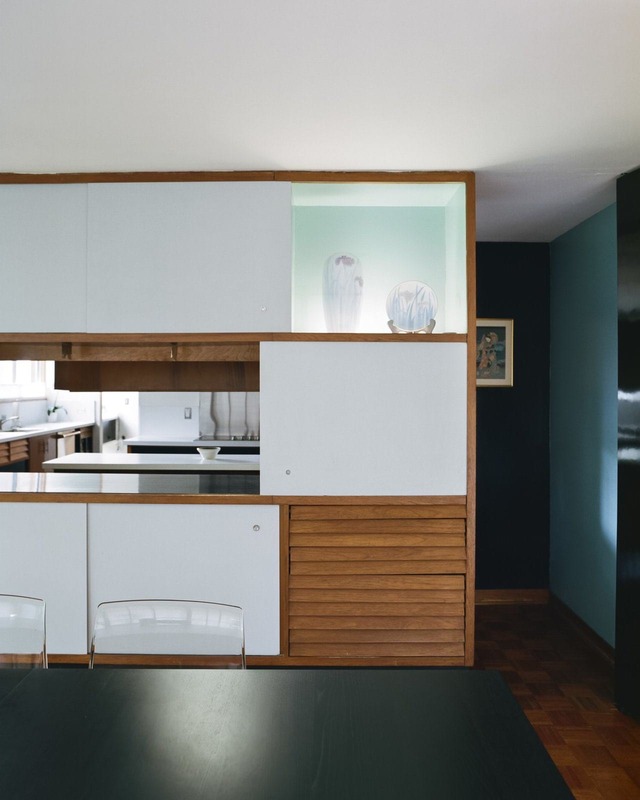 Girard, one of the leading figures of postwar American design, exerted himself to the utmost by dabbling with interior, furniture and textile design on top of his work in architecture. Let’s rewind back to 2009; Rob, an estate planning attorney and his wife Mary, a CPA, were on the lookout for a home to settle in Detroit’s prosperous Grosse Pointe Farms. 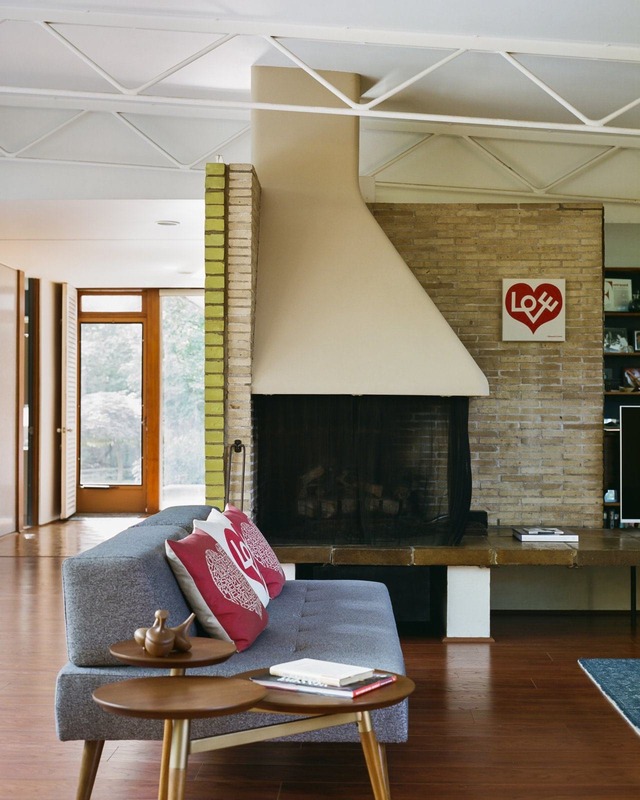 When they came across a listing of a one story post-and-beam home in said area, the couple unknowingly landed on a hidden treasure. 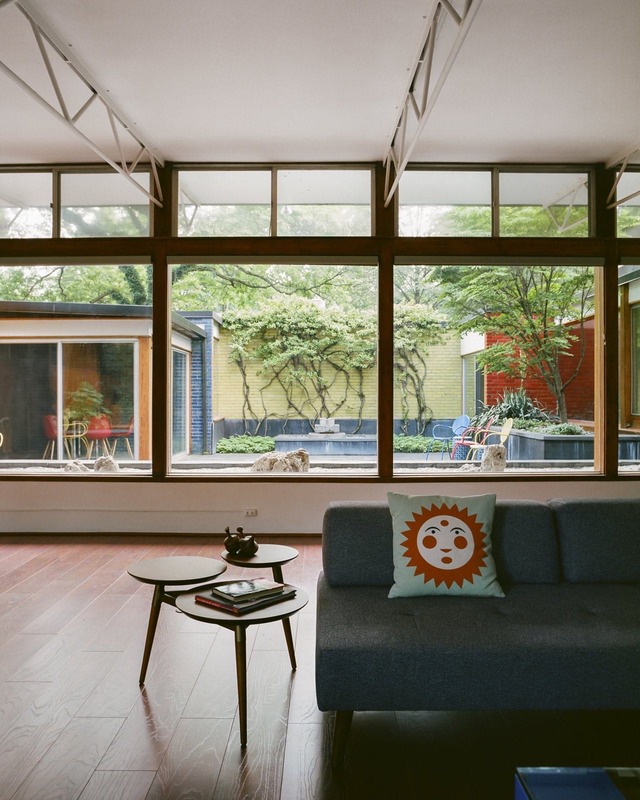 Although the midcentury modern home was not in its ideal condition, the beautiful Japanese-style doors, open layout, striking colors and copious amount of light flooding in thanks to the floor to ceiling windows extending across the sides won over the Luberas in a heartbeat. In the midst of carefully planted trees, vines and bushes, a beautiful swirl-patterned entryway surrounds the 4,600 square foot house. 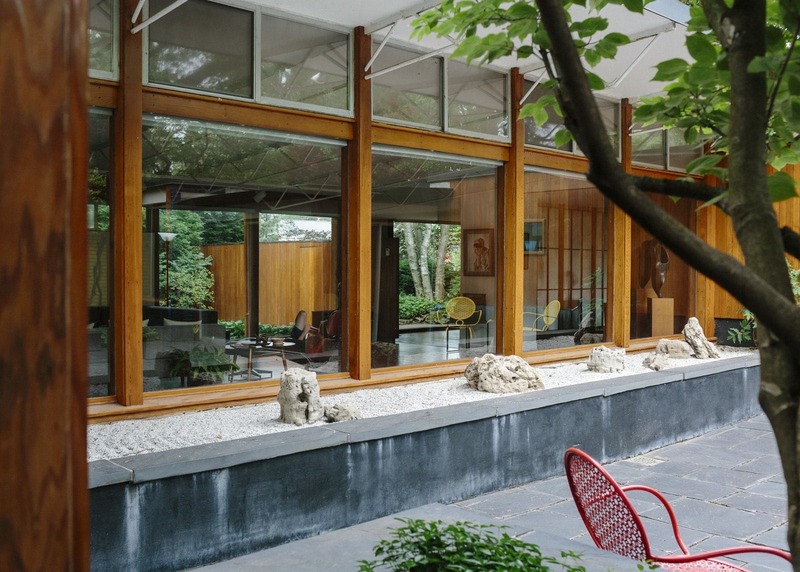 From the moment of entering the site, the Japanese-influenced work on the home is apparent. A big red door and shoji-like laminate screens ornament the front of the home, laid in the midst of natural greenery. A large floor to ceiling window left to the entry door gives a peek into the home at first glance. 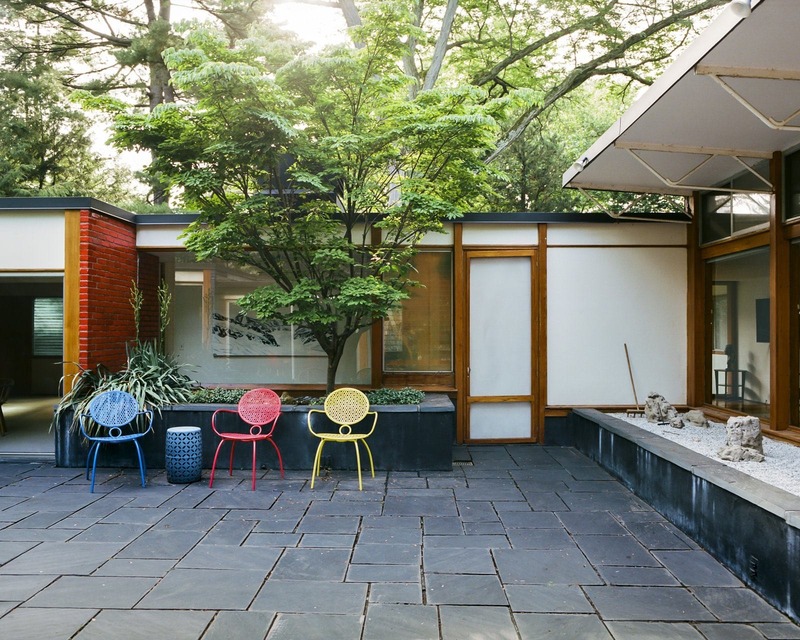 Positioned in the center of the home is a courtyard which makes playful use of primary colors; a wall of brick painted in yellow rests at the other end of the courtyard in between glazed brick walls of red and blue and chairs in the garden have been painted to match. The side of the home is full length floor to windows, framed with gorgeous dogwood tree. Adjacent to this, Japanese influenced rock gardens have been laid down, complete with slate stone pavers on the ground. More than merely eyecandy, the brick wall also serves the purpose of connecting exterior to interior. The yellow wall stretches into the living room, where it assumes form of part of an impressive hearth. The interior design also borrows elements from Japanese decor – A Fusuma door separates the large living room area from the dining room. 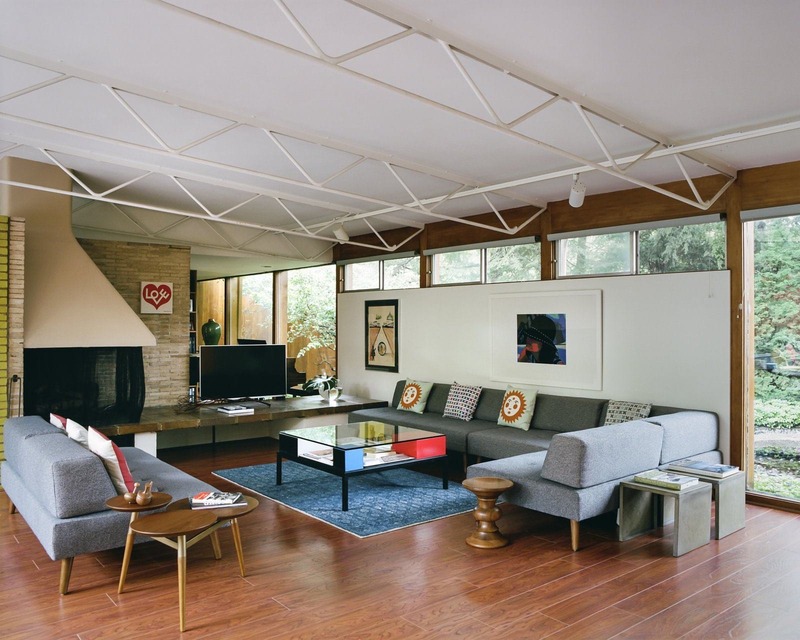 The living room is a large, open space with open-joist ceilings. 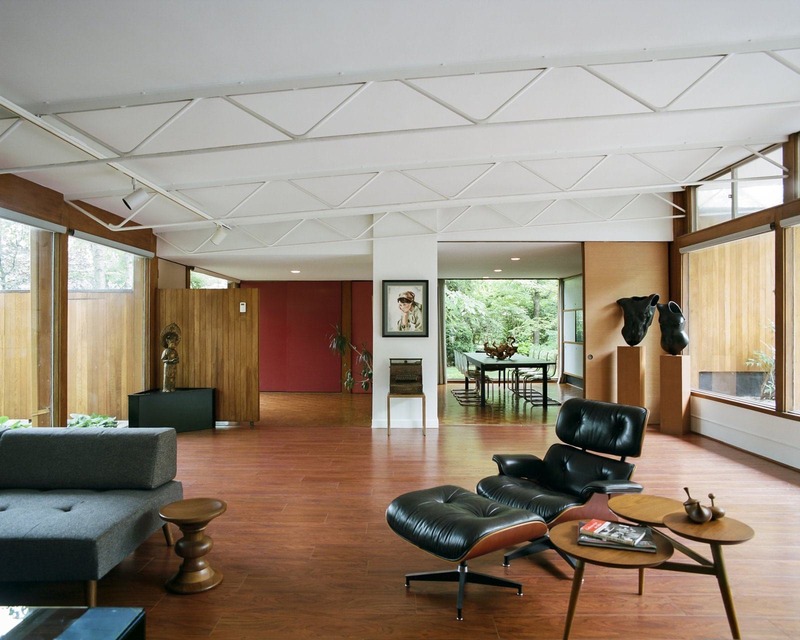 The modern interior decor includes Janice Trimpe sculptures, Eames lounge chair and ottoman and Eames walnut stool. The dining room follows suit in its traditional Japanese influence in hues of black, white and the same natural wooden hues found throughout the rest of the residence. The master bedroom is found at the end of the building, a spacious room with minimal interior decor. Again, floor to ceiling windows make sure plenty of natural light pours into the natural beige-hued bedroom, in which the original sconce remains on the wall behind the bed. 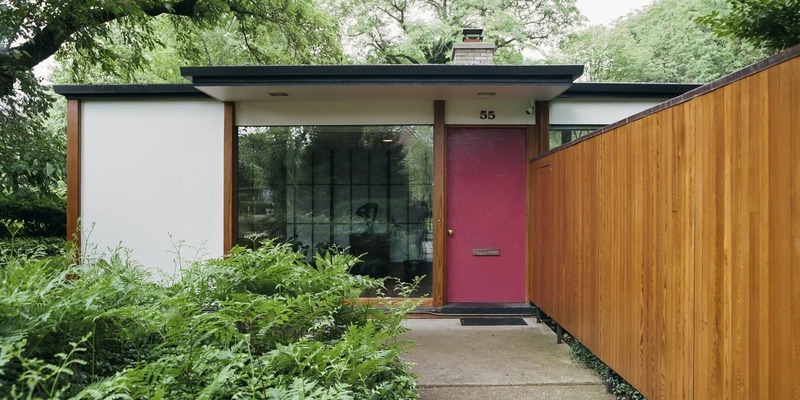 Needless to say, the Luberas truly hit a goldmine by stumbling upon this last standing Alexander Girard Home!